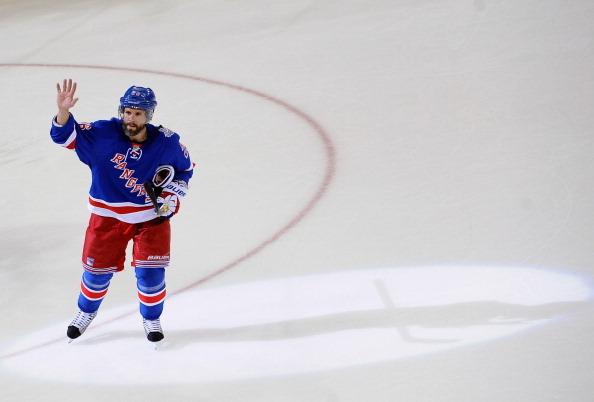 Martin St. Louis has finished his Hall of Fame career as a Ranger. Photo courtesy of Getty Images. After 16 seasons, 1,241 NHL games, 1,033 points, three different teams and one Stanley Cup Championship, Martin St. Louis has retired from the National Hockey League as a member of the New York Rangers. St. Louis, 40, sees his career come to a close following a 16 year adventure that saw him play for the Calgary Flames, Tampa Bay Lightning, and finally the New York Rangers. In over 1,200 career games played, St. Louis totaled 391 goals and 641 assists, putting him in the exclusive 1,000 point club, with just 82 players ever accomplishing that feat. St. Louis was an undrafted player out of the University of Vermont, first getting signed by the Calgary Flames. Because he was smaller, he was usually overlooked by scouts and GMs around the league. In 2000, his contract was bought out by the Flames. But the Tampa Bay Lightning gave St. Louis a chance, and he took it and never looked back, establishing himself as one of the best offensive players in the entire league. In his 14 year stint with the Lightning, St. Louis won two Art Ross Trophies, the Hart Memorial Trophy, the Lester B. Pearson Award, three Lady Byng Trophies and six All-Star appearances. But he will forever be remembered for carrying the Lightning to their first ever Stanley Cup Victory in 2004. St. Louis had a 94 point (38-56-94) regular season, and he added 24 points (9-15-24) in 23 playoff games en route to the Championship. After a disagreement with Lightning GM Steve Yzerman, he requested a trade out of Tampa, citing the Rangers as his preferred destination. The Rangers and Lightning took part in the first ever captain-for-captain swap, with Tampa receiving Ryan Callahan and some draft picks. St. Louis’ time with the Rangers was brief, but it was certainly special. He will forever be remembered for his heroic efforts during the Rangers magical run to the Stanley Cup Finals, staying with the team following the passing of his mother. Nobody will ever forget his goal on Mother’s Day at Madison Square Garden, or his overtime winner in Game 4 against the Montreal Canadiens. He was an amazing locker room presence, serving as a mentor and a leader to everyone in the Rangers locker room. Guys like Kevin Hayes, JT Miller and Jesper Fast, who St. Louis took under his wing, all benefitted from his knowledge of the game and willingness to teach. And he was a great morale guy, as shown by this tweet from the Rangers. After he announced his retirement, the outpouring of support and recognition around the league was incredible. Everyone from Michael Grabner to Andrew Ference, analysts and writers around the league, and all of his teammates recognized his amazing career and everything that he has done for the game. St. Louis opened the door for smaller stature players, and proved that size doesn’t matter when it comes to the NHL. Guys like Jeff Skinner and Mats Zuccarello have St. Louis to thank. St. Louis was a player that I had always loved watching even before he came to the Rangers. He had incredible amounts of skill, and scored some great goals. His one-timer from bad angles below the faceoff circle was a thing of beauty. I was born in 1995, so I don’t have these grandiose memories of the Rangers winning the Stanley Cup and parades in Manhattan. The 2013-14 season provided some of my favorite Rangers memories ever, especially the run to the Cup Finals. I was so happy for Martin St. Louis scored on Mother’s Day, and I’m sure many people had a tear in their eye following his celebration. And when he scored the top shelf goal on Tokarski in Game 4 against the Canadiens, I ran laps around my house because I was so excited. Without him, the Rangers don’t get past the Penguins in round two. It’s unfortunate that the Rangers didn’t have the cap room to sign him for another season, but hopefully he can stay within the organization, maybe working with the Wolf Pack, which is close to where he lives in Connecticut. He was here for such a short time, but St. Louis left a lasting impression on the Rangers, his teammates, and the fans. It was a pleasure to watch St. Louis play, and an honor to have him on the Rangers. I wish Marty the best of luck with his retirement. Posted on July 2, 2015, in Rangers Updates and tagged Lightning, Martin St. Louis, New York Rangers, New York Rangers blog, NHL, NYR, Rangers, Rangers blog, St Louis retire, St. Louis announces retirement, St. Louis retired, St. Louis retirement, Tampa Bay Lightning, TBL. Bookmark the permalink. 1 Comment.